Juicing is all the rage at the moment. It is touted as the better way to get more fruits and vegetables into your body. But is it all just hype, or is it based on scientific fact? Before you decide, let’s look at the positives and negatives of juicing. The major positive of juicing is that it will help people who do not like to eat fruits or vegetables get an acceptable intake of these excellent nutrients. If juicing serves to encourage this group to increase their intake of vegetables and fruits, then it is a good thing. However, is juicing as good as eating the whole fruit or vegetable? The answer is definitely: No. What’s the downside of juicing? When you juice, you extract the juice but you leave most of the fibre behind. That is a bad outcome because fibre is very important part of making you feel full. Fibre is important in maintaining healthy bowel function, and it decreases the sugar surge after a carbohydrate meal. It takes approximately 3 to 4 apples – depending on their size – to make a glass of apple juice. It also takes about 4 oranges to make one glass of orange juice. That means that your calorie intake will at least triple if you drink the juice instead of eating the whole fruit. But it is not only the calorie content that increases with drinking the juice; it is also the speed of the rise in blood sugar levels. Fibre slows down the speed at which sugar is absorbed from the gut. In the absence of fibre, sugar is absorbed much more quickly; and as a result, blood sugar levels rise much more rapidly. Rapid rises in blood sugar levels are a bad result for anyone trying to control weight because it causes the release of more insulin, and this has a negative impact on fat metabolism, which results in weight gain. If you juice vegetables, the calorie content is a lot lower, but the principles remain the same. Chewing is an important aspect of the satiety process. It causes the release of some important hormones, and is also a great psychological component in creating that feeling of fullness. By drinking the juice, instead of eating the fruit or vegetable, you remove these important determinants of satiety. This increases your risk of taking in more than you need. For many people, drinking is usually accompanied by eating, and as a result, there is a greater temptation to eat something with the glass of juice. 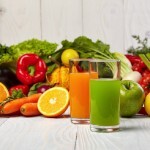 Many people have been led to believe that drinking juices is a good way to detoxify the liver. Sadly this is just another of those urban or internet myths. It is the job of the liver to cleanse and detoxify the blood. I find it difficult to understand how giving the body’s detoxifying organ – the liver – something extra to detoxify is going to help the process of detoxifying the body. There is no reliable scientific evidence that shows that juicing will detox your body. I believe that the best thing you can do to help your liver to ‘detox’ is to eat less and drink more water. For a proven and scientifically backed program to help you lose excess weight, check out Dr Leon’s book: I Can’t Believe it’s a Diet.